The Beinecke Scholarship, a program of The Sperry Fund, recognized Jenkins’ achievements with a $34,000 award to attend graduate school in the arts, humanities or social sciences. Jordan Jenkins, a third-year student at the University of North Carolina at Chapel Hill, was recently selected for the prestigious Beinecke Scholarship. Jenkins, who is pursuing majors in history and political science, hopes to earn a doctorate of philosophy in United States history, focusing on race and class in the American South. The Beinecke Scholarship, a program of The Sperry Fund, recognized Jenkins’ impressive achievements with a $34,000 award to attend graduate school in the arts, humanities or social sciences. She is one of 18 students nationwide to win the award, selected from a pool of 96 nominees. Jenkins is UNC-Chapel Hill’s sixth Beinecke Scholar. Jenkins, from Morganton, has previously interned for the UNC Center for the Study of the American South and worked for the Southern Oral History Program, helping to create the new student organization, the Southern Stories Project. Outside the classroom, Jenkins performed as an alto saxophonist in the Marching Tar Heels, the Olympic Pep Band and the Basketball Pep Band. She served as secretary of the university chapter of the Young Democrats and is a member of Tau Beta Sigma National Honorary Band Sorority. She is currently studying abroad at the University of Edinburgh. A member of Phi Beta Kappa and Honors Carolina, Jenkins is writing her senior honors thesis on the formation and manipulation of white identity in Southern politics. 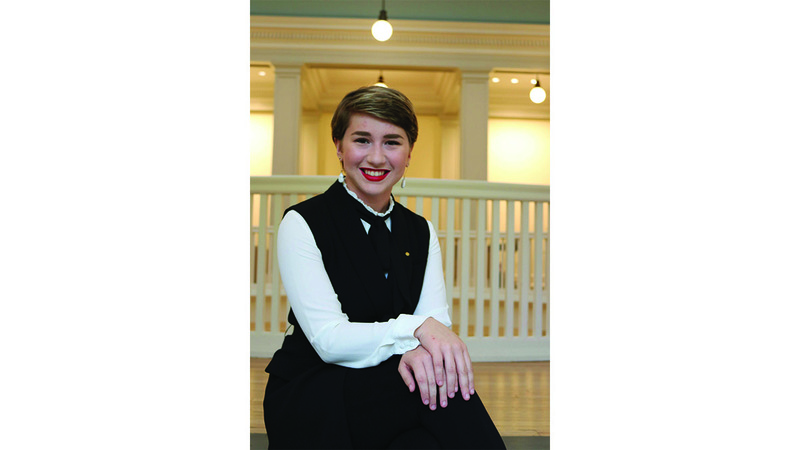 She plans to continue her research in graduate school to paint a nuanced portrait of Southern politics and reveal a hopeful vision of what the future could be for the American South. “We couldn’t be more delighted that the Beinecke directors recognized Jordan’s promise as a scholar. Jordan has the rare combination of intelligence, integrity, curiosity, persistence, analytic skills and ethical investment that will make her a leader in her field,” writes Professor Inger Brodey, director of the Office of Distinguished Scholarships. The Beinecke Scholarship Program was established in 1971 by the Board of Directors of The Sperry and Hutchinson Co. to honor Edwin, Frederick and Walter Beinecke. The program seeks to encourage and enable highly motivated students to pursue opportunities available to them and to be courageous in the selection of a graduate course of study in the arts, humanities and social sciences. Since 1975, the program has selected more than 628 college juniors from more than 110 different undergraduate institutions for support during graduate study at any accredited university.